Shell easily beats Exxon when you look at dividend yield, but does that make it the better buy? ExxonMobil Corporation (NYSE:XOM) and Royal Dutch Shell plc (NYSE:RDS-B) are giant, diversified oil and natural gas companies. Exxon's yield is around 4.5%, while Shell's is an even more impressive 6.1%. They are very similar companies in many ways, but you need to know more than just that yield statistic to understand which is the better buy for you. Exxon and Shell both offer investors exposure to the upstream energy sector via their massive oil and natural gas drilling businesses. This is the main driver of each company's top and bottom lines. However, that's not all either company does. Both have balanced that upstream operation against downstream assets in the chemicals and refining spaces. These businesses tend to do better when energy prices are low because oil and natural gas are key inputs. This diversification helps to offset the pain of oil downturns. One key difference between the two, though, can be found on their balance sheets. Exxon has historically focused on keeping long-term debt to a minimum. At the height of the last oil downturn, long-term debt at the company was just 15% of the capital structure. Currently, that figure is around 10%. This gives the oil major a huge amount of financial flexibility during downturns because it can add debt to help support its business. Shell makes greater use of long-term debt, which sits at around 20% of the capital structure today. Offsetting that greater use of leverage, though, is a larger cash balance. Shell holds about $20 billion in cash compared to Exxon's roughly $6 billion. Stepping back, it would be easy to look at this issue as a wash. However, it had a material impact on how each company maneuvered through the deep oil downturn that started in mid-2014. XOM Dividend Per Share (Quarterly) data by YCharts. Shell paused dividend increases and instituted a scrip dividend (paying dividends in additional shares instead of cash to preserve money). Exxon kept increasing its dividend every year right through the downturn. In fact, Shell's dividend hasn't been increased since 2014. It has ceased the scrip dividend, which is a step in the right direction, but investors have yet to be rewarded with dividend growth. With oil prices hitting another soft patch recently, a dividend hike in the near term would seem unlikely, too. 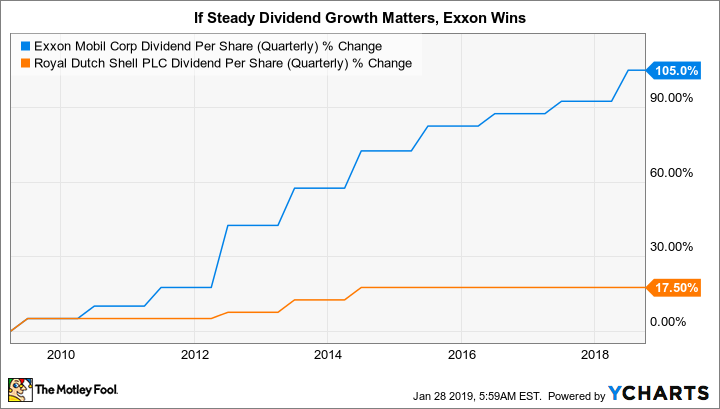 If dividend growth is important to you, Exxon's dividend record is easily one of the best in the oil and gas space. The higher yield at Shell is partly a reflection of the differences here. 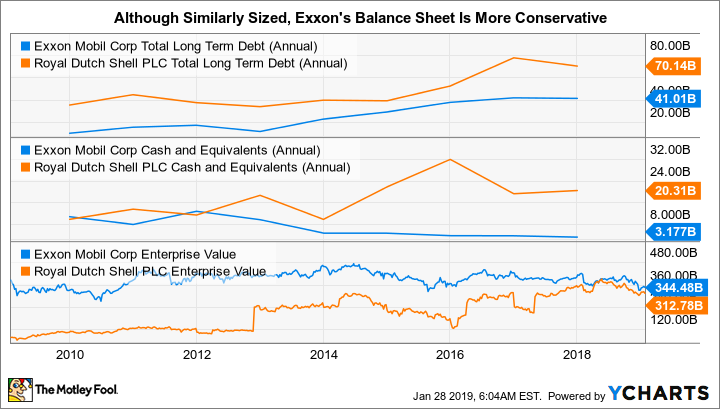 Exxon and Shell, then, are two diversified energy giants that have slightly different approaches to using their balance sheets. This isn't a minor issue, since it has had a material impact on their dividend policies. But there's another big issue facing both companies that investors need to think about: carbon. XOM Total Long Term Debt (Annual) data by YCharts. Exxon has been very slow to address the issue at all, finding itself in court accused of, to simplify a very complicated legal case, lying to investors about what it knew about global warming. At this point, it is embracing the issue more fully, calling for a carbon tax. It has also been working to increase its exposure to natural gas, a fuel expected to help the world transition to carbon-fee power, like solar and wind. What Exxon hasn't done is materially alter its business focus. It believes that oil and natural gas will remain important for decades to come, and that it should keep drilling for these depleting assets to ensure there's enough to go around. It currently has plans to spend as much $30 billion a year through 2025 to support long-term production growth. If you are looking at Exxon, you need to buy into the idea that oil and natural gas will remain vital sources of energy for many years into the future. Shell, while still highly dependent on oil and natural gas, has been far more vocal about the need to start addressing carbon today. It has taken notable steps to shift its business, including buying solar power assets, investing in wind turbines, and even buying an electric vehicle charging station company. Shell is building an electricity business that it believes will someday sit beside its oil and gas assets, and it is putting billions into this diversification effort. It's not that Exxon is sitting still with regard to carbon, but Shell is definitely taking a more aggressive approach to shifting its exposure. If that sounds like the right move to you, then you'll probably want to invest in Shell instead of Exxon. Check out the latest Exxon and Shell earnings call transcripts. To be fair, it's hard to make a clear call between Exxon and Shell. They are both very well-run and diversified energy companies that reward investors with fat dividend checks. You probably wouldn't go wrong buying either one of them. But before you simply choose the one with the higher yield, you need to step back and look at some of the important nuances. The use of leverage has had a material impact on each company's dividend. And their differing views of the future are starting to show up in the capital investments each company has made. Neither of these issues matter if you only plan to hold Exxon or Shell for a couple of months. But if your intended holding period is measured in years or decades, then you'll want to carefully consider debt policies and corporation direction -- which are, perhaps, the two biggest differences between Shell and Exxon today.